disability sport and the media. Nigel Thomas is Head of Sport and Exercise at Staffordshire University, UK, where his research focuses on the history, mainstreaming, and media coverage of disability sport. He previously worked for ten years with young disabled people as a sports development officer in local authorities and national governing bodies. Andy Smith is Lecturer in the Sociology of Sport and Exercise at the University of Chester, UK. He is a co-editor of the International Journal of Sport Policy, and a co-author of Sport Policy and Development: A Sociological Introduction, and An Introduction to Drugs in Sport: Addicted to Winning? Both books are published by Routledge (2009). "There is a real need for this book. 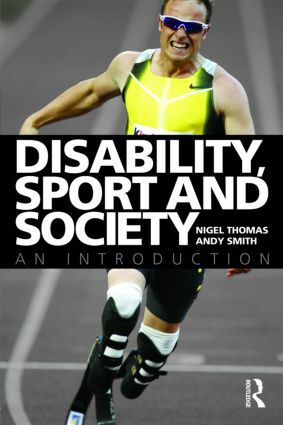 It provides a unique and valuable sociological analysis of disability sport." Nigel Thomas is Head of Sport and Exercise at Staffordshire University, UK, where his research focuses on the history, mainstreaming and media coverage of disability sport. He previously worked for ten years with young disabled people as a sports development officer in local authorities and national governing bodies. Andy Smith is a lecturer in the Sociology of Sport and Exercise at the University of Chester, UK. He is a co-editor of the International Journal of Sport Policy, and a co-author of Sports Development and Sports Policy in Society: An Introduction and An Introduction to Drugs in Sport: Addicted to Winning? Both books are published by Routledge (2009).